" Most people know Edgar Mitchell best as an Apollo 14 astronaut and sixth person to walk on the moon. 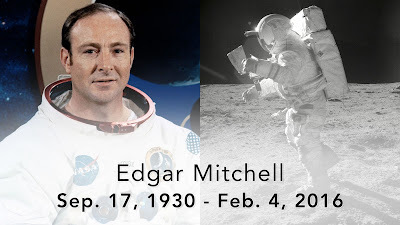 A US Navy Captain, MIT-trained aeronautics engineer, recipient of the Presidential Medal of Freedom, the NASA distinguished service award, and 2005 nominee for the Nobel Peace Prize among many other honors, Edgar Mitchell was a hero in the truest sense of the word. What fewer people know is that Edgar’s spirit of exploration extended well beyond space travel to his lifelong dedication to increasing our scientific understanding of the nature of consciousness. Space exploration symbolized for Mitchell what it did for his nation ~ a technological triumph of historic proportions, an unprecedented demonstration of scientific achievement, and extraordinary potential for new discoveries. What Mitchell did not anticipate was a return trip from the moon that triggered something even more powerful. As he gazed at Earth floating in the vastness of space and contemplated the history and hopes of humankind on that lonely blue sphere, he was engulfed by a profound sense of universal connectedness. But the experience that came to him while hurtling through space was profound. "My understanding of the distinct separateness and relative independence of movement of those cosmic bodies was shattered. I was overwhelmed with the sensation of physically and mentally extending out into the cosmos. The restraints and boundaries of flesh and bone fell away. I wondered if Stu and Alan [companion astronauts] were experiencing it as well ... Somehow I never felt the urge to ask." The experience led him to a startling hypothesis: Perhaps reality is more complex, subtle, and inexorably mysterious than conventional science had led him to believe. Perhaps a deeper understanding of consciousness could lead to a new and expanded view of reality in which objective and subjective, outer and inner, are understood as complementary aspects of the miracle and mystery of being. And 15 years later in 1998, another former naval aviator, myself, ~ had completed my journey to fully surrender to love and discovered a psychic energy field of love and soul consciousness that not only existed beyond time and space but also beneath our deepest fears ~ and whose principle property was the universal urge to unite. 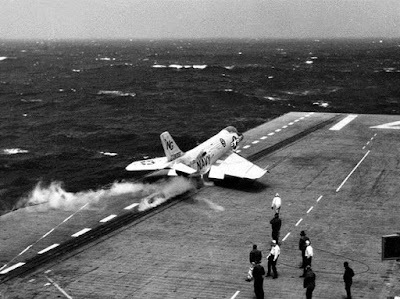 It was a brutal night and I saw that the launch crew chief had all he could do to remain upright on the deck. After climbing into the cockpit I brought the F3H Demon to full throttle and felt the supersonic Navy jet shake with power as it strained against the bridle. Keenly aware of sounds, everything sounded good as I did a final check of my instruments. The launch crew leader raised his neon batons in the air and waited for my salute, which I gave. The launch crew then released the bridle which would send me hurtling into the stormy night sky at 155 mph within 3 seconds. I braced my head against the headrest and anticipated the sudden 3 G rush of acceleration. Within seconds, thousands of pounds of steam pressure drove me back into my seat and catapulted the plane into the stormy night sky. My hands and eyes quickly swept through the cockpit as I had done hundreds of times before and I awaited my gradual acceleration to climbing speed. But it did not come. Something was wrong! I was not gaining airspeed! The plane was shaking and obviously close to stalling speed and I was rapidly losing altitude. Only seconds away from crashing I felt myself being physically crushed by fear and the enormity of my desperate situation. I was going to die! I fought to stay airborne. In a state of total fear and panic I frantically reviewed my only options. Crash, go down with the plane... eject and hope to stay alive long enough in the icy water and be picked up by the carrier which would have to be within 3 minutes. The stall horn was now blaring! I was only 50 feet over the water and seconds away from crashing and I felt myself being completely crushed into the seat by my fear ~ so I exercised my final option ~ I fully surrendered to that moment! In that timeless split second of total surrender and resultant fearless clarity, I instantly noticed that the gear landing light was still on and that I had obviously not raised it after takeoff ~ the plane was carrying too much drag to gain altitude and airspeed and I calmly raised the gear and regained airspeed and altitude. It was only years later, while experiencing a re-birthing exercise, did I connect that crushing feeling I had experienced that night on the South China Sea for it was indeed my original birth trauma and I had exercised the same option I did on that fearful night as a Navy pilot 28 years later ~ I totally surrendered, from a place of numbing fear, and was born two minutes before my twin. I still vividly remember the three lights over the birthing table as I opened my fear closed eyes at the Boston Lying In Hospital on the morning of January 18, 1934. Obviously, part of me knew that a place of timeless serene calmness and clarity lay beneath my deepest fears that my life and death experience that night on the USS Ranger forced me to surrender to, embrace and go beneath that fear ~ and it became my first dramatic experience of the reality of a Unified Field of love and soul consciousness, beneath our deepest fears, which later in my life I would find and prove by fully surrendering to love. What happened that night on the South China sea would become the foundation of my life's quest or journey to demonstrate that beneath our deepest fears is a spring of love, joy and soul consciousness and I have helped thousands of others go beyond their fears and surrender to love through my book Radical Therapy ~ and discover for themselves that love is the true foundation of all true emotional healing. Both Edgar Mitchell and myself in our courageous explorations of outer and inner space have discovered the same phenomenon ~ a profound sense of universal connectedness ~ which Edgar witnessed and I discovered ~ which exists not only beyond time and space but also beneath our deepest fears and whose principle property is the urge to unite ~ which most of us continue to ignore at our growing peril. Thank you Edgar, for sensing the truth and relevance of my Unified Field in 1998. Being on the edge is quite often bending reality and recognizing a great truth that was always there beneath our deepest fears.